I always loved Halloween, but was never someone who put countless hours into a costume. One year I decided I wanted to go full out since some good friends of mine were having a party. 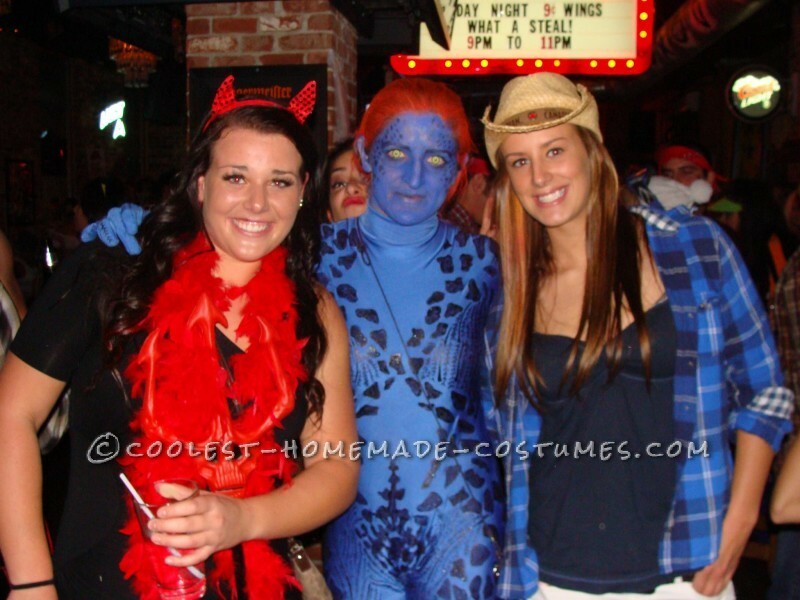 After a few days of research, I decided I wanted to be Mystique, from the X-Men series. My friends thought I was crazy, and many jokingly asked if I was going to go naked with it body painted (NO!). I slowly collected the essential parts of the costume, yellow contacts ($60), blue morph suit ($50) and the necessary paints and makeup. Once all the parts arrived, I spent some time each night painting the scales and design of Mystique’s skin onto the morph suit. Some friends even came over to help me plan the patterning so there were no awkward or unnecessary attention to body parts… while still being true to the original costume of course! I wore the costume to the party and got a fantastic response. It was the perfect about of terrifying and amazement from everyone – mainly due to the yellow contacts but due to the execution of the costumer as well. Around Halloween every year is usually when my university rugby team would advance to the National Tournament. Since that year it almost overlapped with Halloween, I was a bit disappointed I wouldn’t be able to show off my costume in full form in public. We were scheduled to leave Nov. 1st, but I had heard news about a costume contest that was happening at a local bar. When I heard this the night of Halloween, I was confident I could win. So I suited up with the help of some friends and we headed to the bar to “show off” my costume. We weren’t there to party due to our tight schedule with rugby but to see if my costume had what it takes! At the bar, I could see people whispering and pointing at my costume. As I often noticed this happening, I took advantage to get into character. When someone would turn back to get their friend(s) attention to show them, I would stare at them just as they looked back at me. I happened to scare people everytime!